Templeton Asset Management’s Mark Mobius says he’s high on consumer and commodity stocks because they can survive another financial crisis — which he says is inevitable because the causes of the 2008 crisis haven’t been addressed. “The problem in talking about another crisis is that no one knows when it will happen,” he says. “It could happen next year, it could happen five years from now. So we have to be invested. 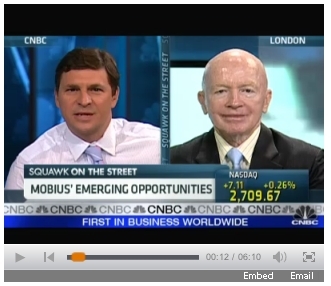 So what we have to do … is invest in stocks that we think can survive such a crisis.” Mobius says another crisis wouldn’t be a terrible thing — in fact, it would offer opportunities for investors. He also offers his take on China’s investment prospects.